Lancashire’s woodland landscape is characterised by small, broadleaved woods, many without a history of recent management. Many are difficult to access and they are often grazed by livestock. Much of the woodland is in the Bowland and Arnside/Silverdale Areas of Outstanding Natural Beauty and contributes greatly to the quality of the landscape. Species include oak, ash and alder, the ubiquitous sycamore and a range of conifers. Although it is possible to market good quality stems it is extremely difficult to find a reliable economically viable market for much of the timber. With relatively high felling and extraction costs due to the terrain, much of the timber needs to be converted to a higher value product as close to the woodland as possible if the owners are to make woodland management work pay its way. The Bowland Initiative Added Value Project (AVP) which completed its work last year looked at adding value to timber to increase income and thus promote the much needed management of these valuable woods. Before discussing the details of the AVP is worth checking our understanding of the Added Value concept. Although widely used the term can easily become misunderstood. Put simply, timber increases in value as it moves along the timber chain - from a standing tree, through harvesting, processing and finally manufacturing into wooden products. There are frequently quoted figures that suggest all woodland owners should be adding value. For example a reasonable quality hardwood log may be worth £40 per m3 at roadside whilst the same timber converted into solid floorboards can retail at the equivalent of £2000 per m3. Obviously the processing costs money and the added value does not always translate in to added profits of the same magnitude ! However if the woodland owner can do part or all of the processing, some added profit can be kept in house. The AVP carried out harvesting trials to demonstrate the process. Timber was felled, extracted and sawn either on mobile sawmills in the wood or at a central depot. The resulting sawn timber was then air and kiln dried and wood products such as flooring, decking and green oak beams produced and sold. The conclusions, published in the AVP final report, show that while some timber can be taken down the Added Value route it is important to be selective and realistic about what can be achieved. The benefits of the approach are much wider than just the increased profits to the woodland owner. In environmental terms the reduction in transport reduces the pollution from road transport. Local businesses are used to carry out the felling, extraction and processing thus stimulating the local economy. The AVP’s first hardwood floor (Ash) being installed in a property in the Ribble Valley, near Preston. The Lancashire Woodlands Project works in partnership with woodland owners, local businesses and the community. H.J. Berry and Sons Ltd. 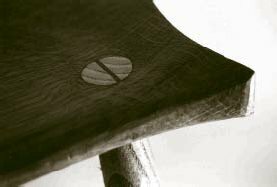 Detail from a Lancashire Craftsman’s chair - from local Elm and Ash (planked, seasoned and kiln-dried by the AVP). Currently the project is working with local businesses to develop new and innovative uses such as making high quality furniture items from sycamore and alder, two species which commonly form a large part of any woodland management programme. It will also raise the profile of local timber and inform the public of the benefits which accrue from its use. The cost and expenditure information gathered as part of the AVP has been brought together into a computer model to assist woodland owners and managers to make decisions. The model will help to identify which woodlands are likely to be the most suitable to take down the Added Value route. The model is currently being tested to evaluate its performance in a variety of circumstances and will then be made available to woodland managers. It will not be a magic wand to wave but will be another tool to assist the decision making process. Another key element of the project work is to investigate the possibility of bringing woodland owners and others in the wood supply-and-use chain together to form a Woodland Industries Group. Initial interest in the idea has been high and a meeting is planned for the near future to see whether there is a viable way forward. The advantage of landowners and business forming a group are many but it is important that the potential members themselves drive it forward for it to be sustainable in the long term. The task facing the LWP is not an easy one and success will depend on showing local business and the public the advantages that can accrue from using local timber. However with the enthusiasm and support shown by a wide range of people and organisations, the prospects are very good for positive results.